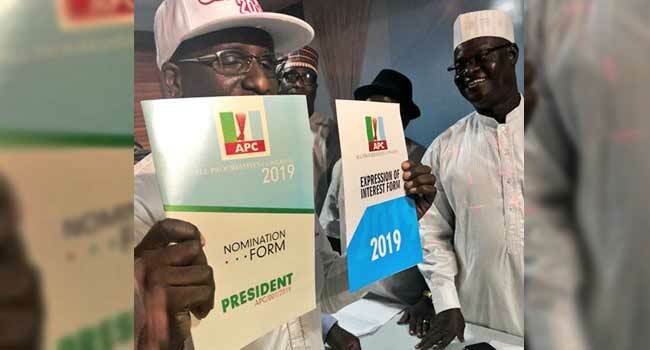 A group has bought the presidential form of the ruling All Progressives Congress (APC), for President Muhammadu Buhari. One of the President’s aides, Bashir Ahmad, disclosed this on Wednesday. Their action comes barely 24-hours after the APC formally announced dates for its primaries as well as fees for forms for various political positions in the party. The presidential primary is scheduled to hold on September 20 while governorship primaries will be conducted on September 25. According to the timetable, members of the party aspiring to contest for the presidency are to pay N40m and N5m for the nomination and expression of interest forms respectively. Similarly, governorship aspirants will pay N22.5m for the forms while the those vying for the Senate, House of Representatives, and House of Assembly seats are to purchase the forms for N7m, N3.85m, and N850,000 respectively.